On Sunday 4th June 2017, 10 members of Beersbridge Road Bible & Crown Defenders L.O.L 891 went on a sponsored walk to raise money for the City of Belfast Loyal Orange Widows Fund. The group of 10 men started set off on their 16 mile journey from Comber, they took in Dundonald, Parliament Buildings Stormont before visiting a number of Orange Halls in Belfast including, Ballymacarrett, Sandy Row and Ballynafeigh. 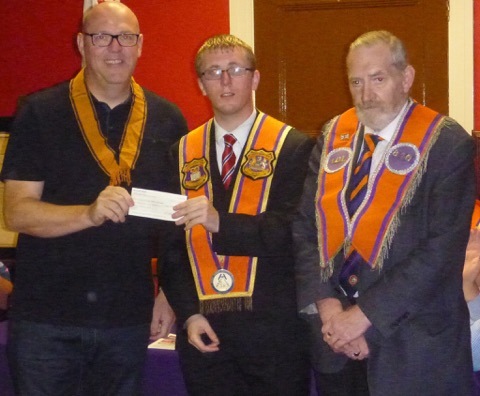 The member of L.O.L 891 from the east of the city raised a very rememberable sum of £1690. This money was presented to No 6 District Representatives to the Widows Fund Wor. Bro. Christopher Cunningham and Wor. Bro. Mervyn Buick by the Private Lodge Representative Wor. Bro. Jim Hannigan. The City of Belfast Loyal Orange Widows Fund was set up to provide finance support to the widows of late members from the County Grand Orange Lodge of Belfast, City of Belfast Grand Black Chapter and those member of the Apprentice Boys of Derry operating within the confines of the County Grand Lodge of Belfast’s boundaries. The currently gives out grants twice a year to help the our Orange Widows and also organises the Annual Divine Service in April each year. The also have a number of street collectors at various parades especially the 12th July. 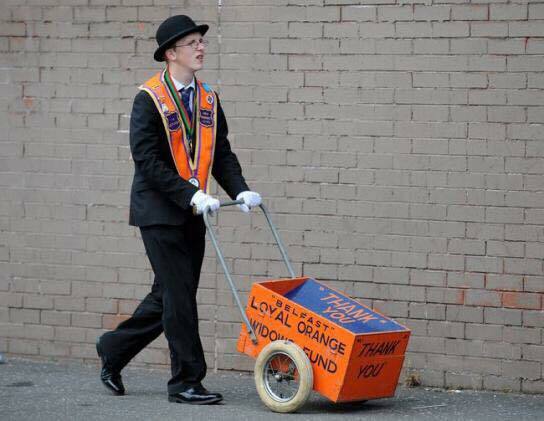 If you see Orangemen collecting money at the 12th parade this is where it ends up. Please consider giving to this very worthwhile cause.